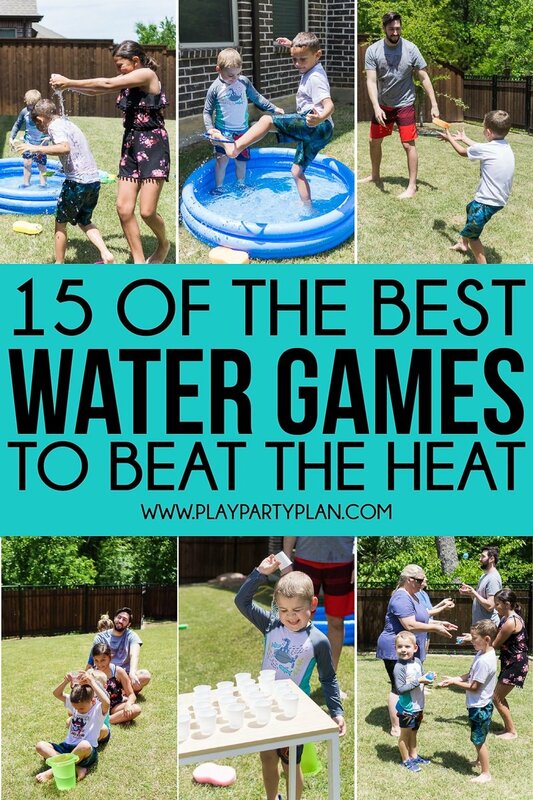 Whether you’re looking for water games for kids or water games for adults, this list will have something to help you beat the heat this summer! 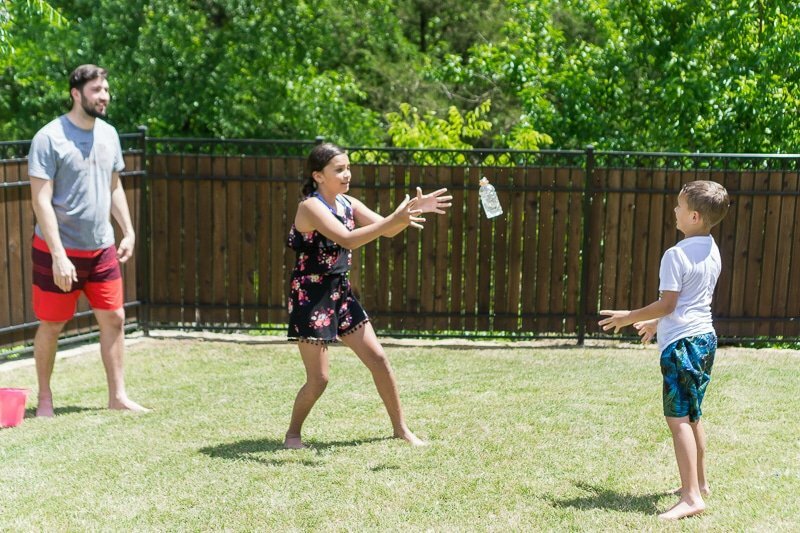 Water ballon games, games to play in the sprinklers, and even one of the most water bottle flip games you’ll ever play! 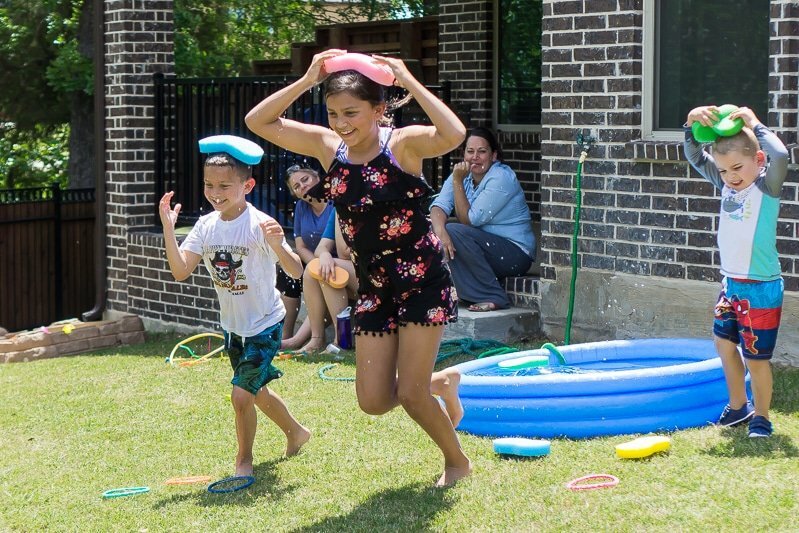 Simply try one or ten of these fun water games on a hot summer day for guaranteed cool down fun! 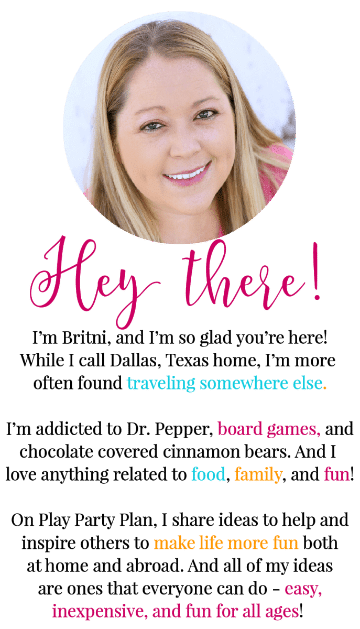 This post contains affiliate links, if you make a purchase I receive a small commission at no cost to you. 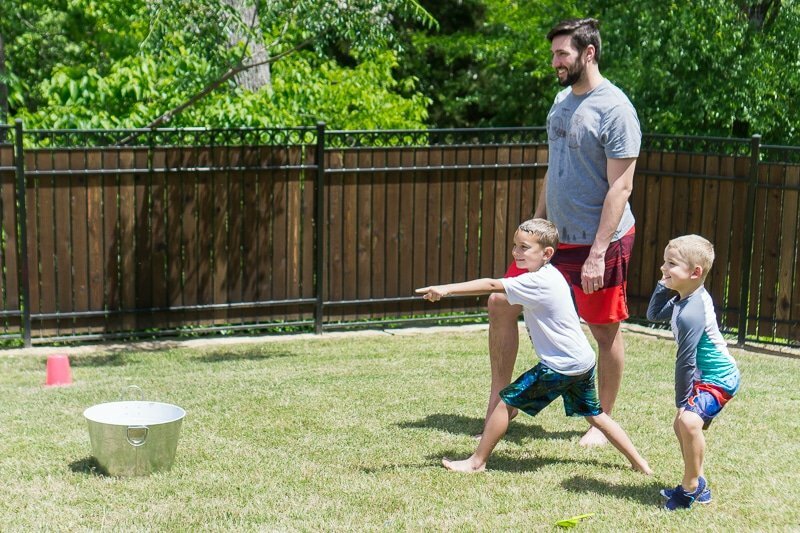 Is there anything better than playing water games on a hot summer day? And I’m not talking about playing water games for kids only – I’m a huge fan of water games for adults too! Water games should be on everyone’s summer bucket list! 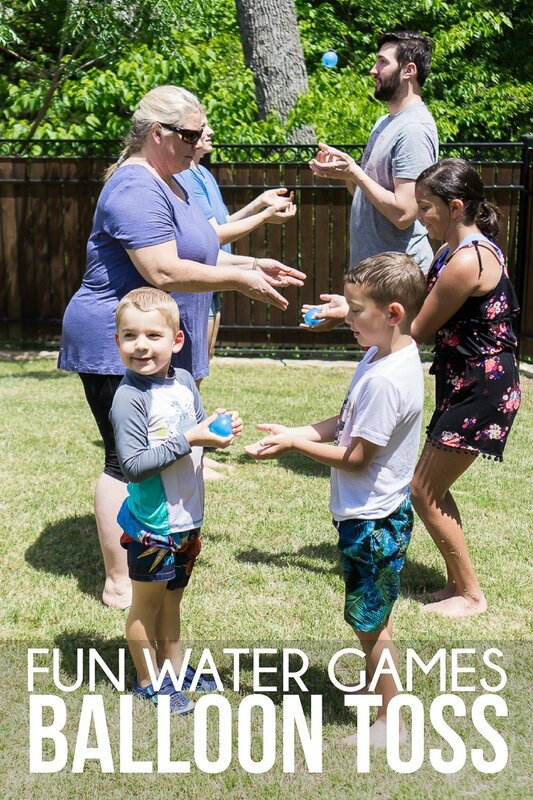 We played all of these fun water games with my son, my friend’s kids, and my family and had a fantastic time – kids and adults alike! These would also pair great with these outdoor camping games on a camping trip this summer! For each of the games in this list, I’ve written them like they’re water games for kids but also included a note about how you could easily each and every one of these games into water games for adults as well. Or just play all together! Here’s a quick glimpse at how fun these games are! Luckily the main supply in any fun water games is simply water. But these water games incorporate a bit more than that but not much more! Here’s a supply list for all of the games – whether you want to just play the water balloon games or all of them! I’ve included as much information as possible about each of these games but if you still have questions – feel free to leave a comment, and I’ll try to answer! 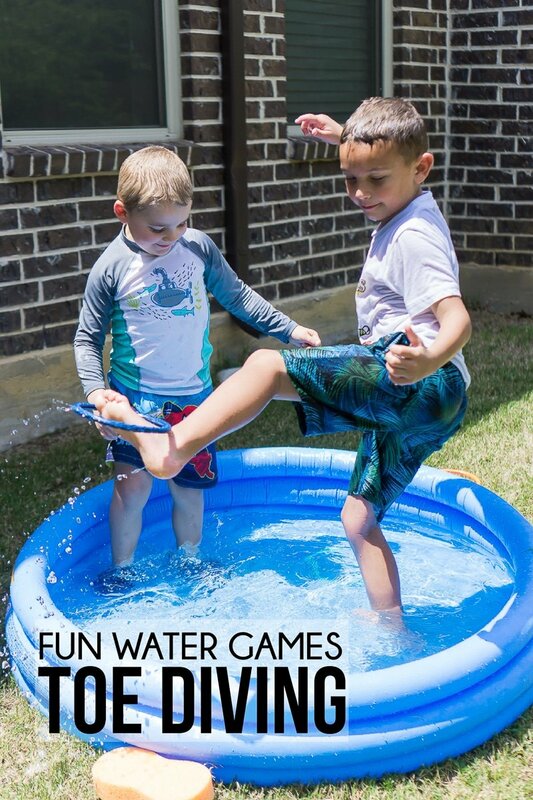 And if you don’t want water games, these fun outdoor games would be a great alternative! These are water games where either teams are racing to do something whether it be fill a bucket with water or grab a diving ring with their toes! Prep: Put one full bucket of water in the grass and have one player sit right behind the bucket. Have the rest of the team sit in a straight line right behind the first player. Have the last person in the line turn and face the other way so the last two players are back to back instead of one after another. Put another either smaller bucket or a bucket with a marked halfway line in front of the last player. Play: Give the first player an empty cup. They must dip the cup in the full bucket of water and pass it backwards over their head to the next kid. The second kid must then pass it over to the third and so on until the final kid on the team dumps the water in the cup into the empty bucket. Then pass the empty cup of water back up to the front. The first team to fill their bucket wins. Adult Version: Blindfold everyone in the line. Prep: Place a bucket full of water on one side of the yard and place an empty bucket on the other. Have teams line up their players anywhere between the two buckets but once they’re lined up – they are frozen in place and cannot change their placement. One player on each team should be next to the full bucket and one next to the empty bucket. Play: The first player must dunk the sponge in the full bucket of water trying to soak up as much water as possible. The player must toss the sponge to their next teammate who tosses it to the next and so on until it reaches the final player by the empty bucket. That player wrings out the sponge and passes the empty sponge back down the line. First team to fill up their bucket to the marked line wins. Adult Version: Place the buckets much further apart so the sponge has to be tossed harder and longer to get to the next teammate. Prep: Place a bucket full of water (or a kiddie pool) on one side of the yard and place an empty bucket on the other. Give a sponge to each player and have them stand by the full bucket or water (or kiddie pool). Play: Players must dunk the sponge in the water trying to soak up as much water as possible. They then have to put the sponge on their head and hold it their while they run to the empty bucket, hoping to keep as much water as possible in the sponge. Wring out the sponge into the empty bucket and run back, continuing until someone reaches the mark on the empty bucket. First person to fill up their bucket to the marked line wins. Adult Version: They must keep the sponge on their head walking to the bucket without actually holding it on, just balancing it on their head. If they drop the sponge, they must go back to the filling station. Prep: Fill up a plastic kiddie pool and place an empty water bottle (or numerous) in the pool. Place an empty bucket on the other side of the yard. Play: This game is played just like the sponge toss above except you will be using open water bottles. A player must fill a water bottle with water either from a kiddie pool or a hose and toss across a line of their teammates to fill up an empty bucket. 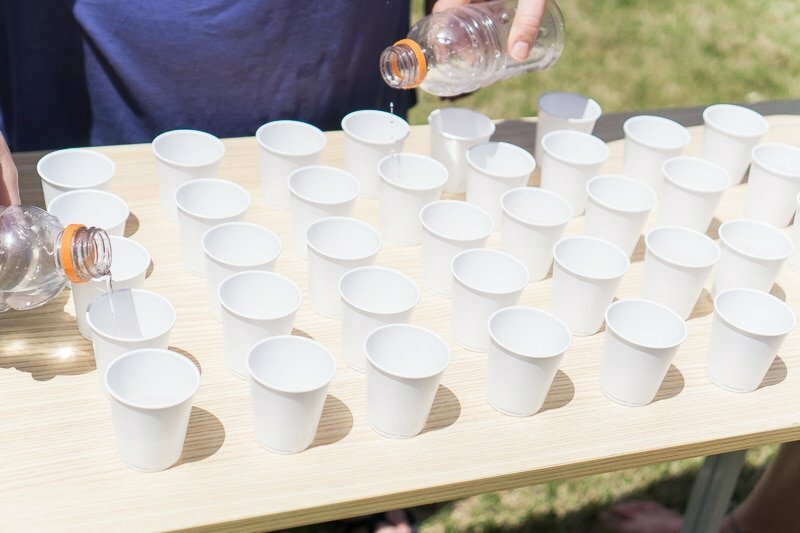 Make sure that team members are standing far enough apart in this one that they’ll likely have to throw the water bottle a little harder so it spins and gets them wet. 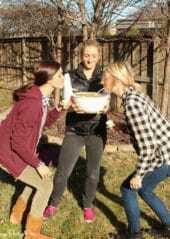 First team to fill their bucket wins. Adult Version: Use 2-liter soda bottles instead. Prep: Setup a full kiddie pool with all sorts of of fun little toys, rings, etc. Play: When you say go, players must try to fish out as many items from the kiddie pool as they can with their toes only. The winner is whoever can get something out first or whoever gets out the most things. Adult Version: Blindfold players for the game. 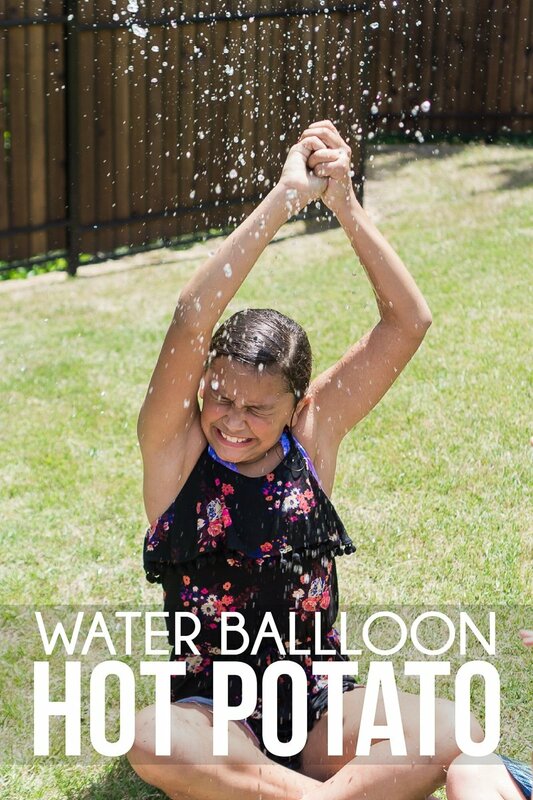 This section is all about the most fun water games you can play with water balloons! And since these auto-fill water balloons are now a thing, water balloon fights and games are no longer as hard to make happen! 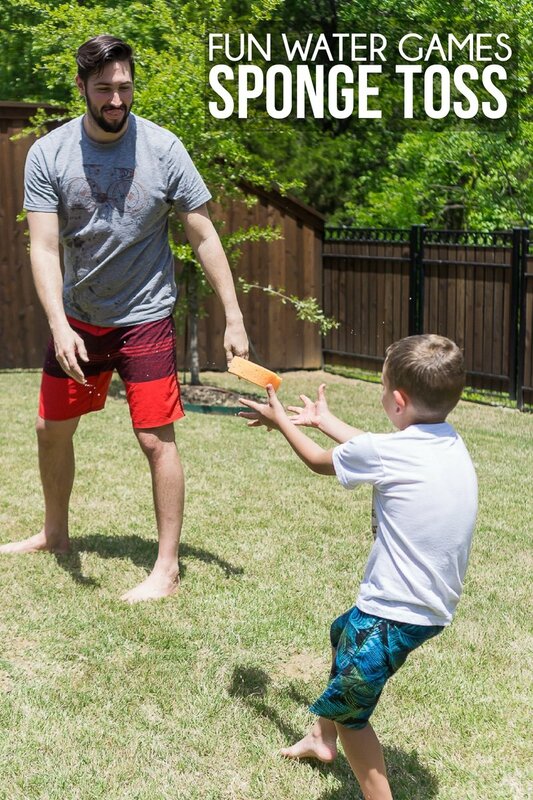 You can always do a regular water balloon fight but that’s not nearly as fun as these games! Play one or more of these games then do a water balloon fight with the rest of the water balloons! 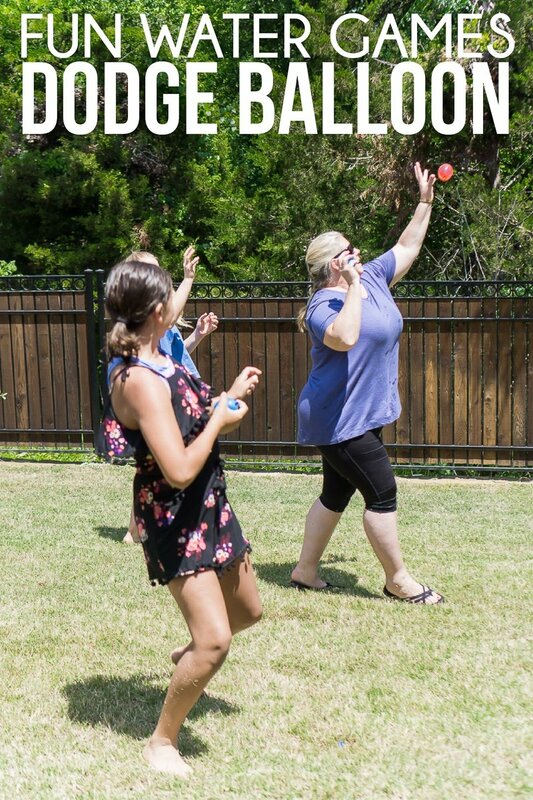 And don’t forget that you can make picking up the water balloon pieces a game too – simply see who can pick up the most pieces in a set amount of time and give the winner a prize like a water gun. Or if you’re playing with young kids, anyone who picks up X number of water balloon pieces and puts them in the trash wins! 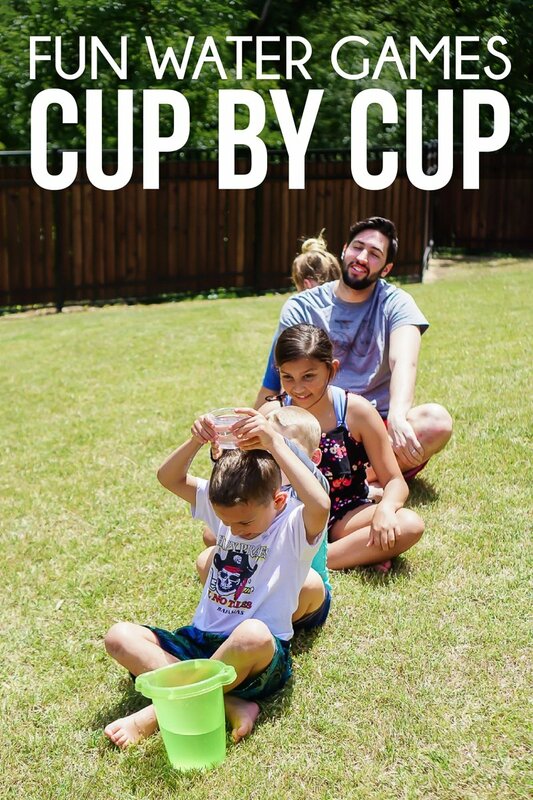 Prep: Fill up a bunch of water balloons and put them in the middle of your yard. For this game, you probably want water balloons that are a bit bigger so they break easily (but not so easily they break when you throw it). Use tape or cones to make a line dividing your yard into two with the bucket in the middle of that line. Split players into two teams and have one team go on each side of the line. Play: Water balloon dodgeball is just like regular dodgeball. 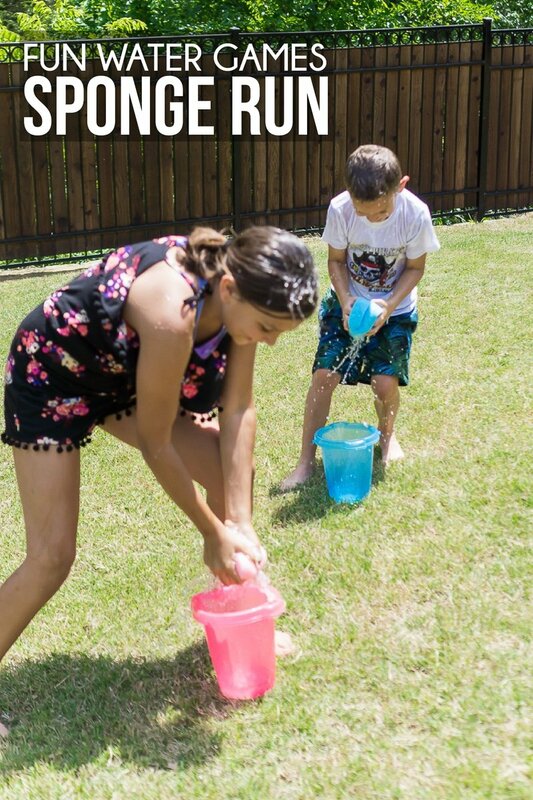 Players have to race to get a water balloon out of the bucket in the middle of the yard when you say go then throw water balloons at each other from their side of the yard. If someone gets hit by a water balloon (not just the water if it pops on the group) and the water balloon actually breaks, they are out and have to sit on the sideline. If they get hit by a water balloon but it just bounces off them and doesn’t break, they can pick up that balloon and keep playing. Or if you want, you can say if it hits them, they’re out. If someone catches a water balloon thrown at them, the person who threw it is out and the person who caught the water balloon can bring someone back in from the sideline who was previously out. If the water balloon breaks while they’re trying to catch it, the person who tried to catch the balloon is out. The team who has the last person standing on their team wins. Adult Version: Balloons must actually break on the players, they can’t just hit people. Prep: Have everyone pick a partner and tell them to stand in two straight lines, partner facing partner. Give each team a water balloon (or a sponge if you’re playing with young kids). 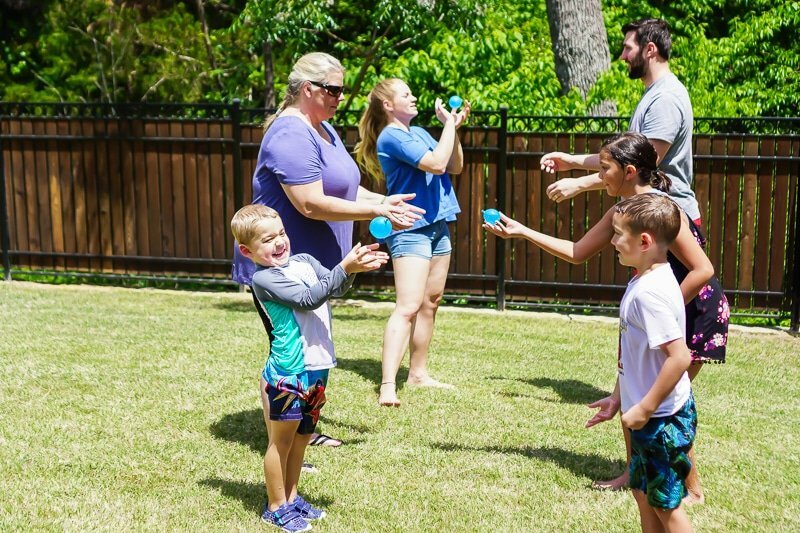 Play: Have someone count to three and on three everyone must toss their water balloon to their partner. If they catch the water balloon or they drop the water balloon but it does not break, one person on the team takes a step back (make sure everyone stays in line). If they drop the water balloon and it pops or it pops while they’re trying to catch it, they’re out. Continue tossing water balloons and taking step backs all at the same time until there is only one team remaining. Remaining team wins. Adult Version: Teams must catch the balloon, not drop it (even if it doesn’t break). Prep: Set up your volleyball net, split your group into two teams and have one team on either side of the volleyball net. Teams must have even number of players. Give each pair of players a beach towel and have one person hold one side of the towel and one person hold the other side of the towel. Play: Give one team a water balloon to start with. The team must put the water balloon in their beach towel (being held by a player) and serve it by throwing it over using only their towel (and arms to catapult the towel over the net). The other team should try to catch the water balloon in their one of their towels. Continue volleying the water balloon back and forth over the net until one team drops it. If a team scores an ace (the other team drops/breaks it on the serve), they get two points. Adult Version: Use full-size balloons instead of water balloons. 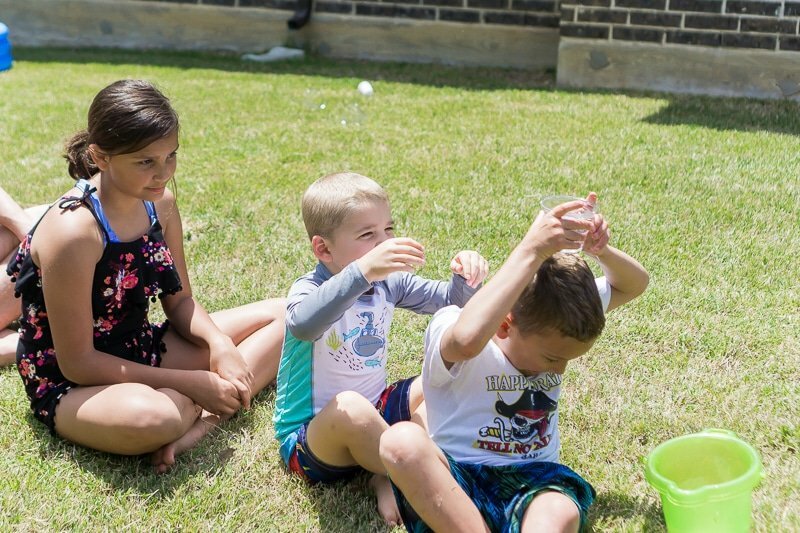 Prep: Fill water balloons and have everyone sit in a circle in the yard. Give one person in the circle a water balloon. Play: Players must pass the water balloon around the circle while music plays. Stop the music randomly (without looking at the circle so you don’t know who has it) and whoever has the balloon when the music stops must pop the balloon above their head and is out. 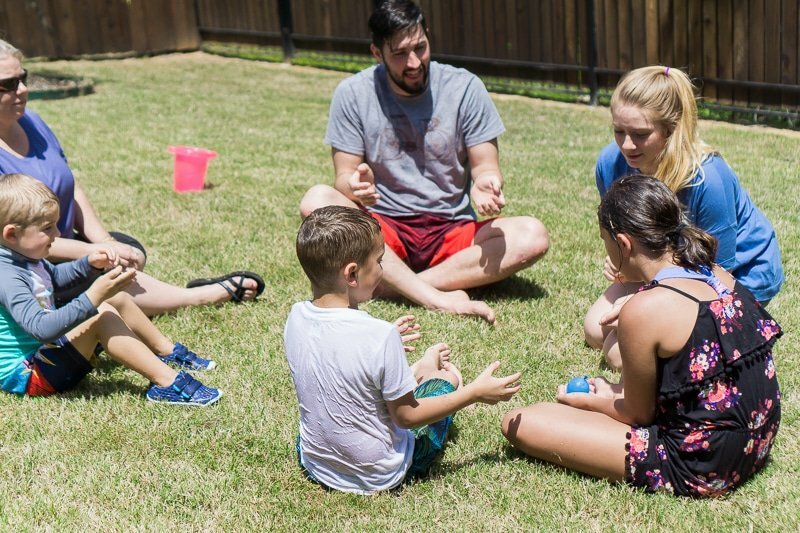 If there’s confusion about who “has” the water balloon when the music stops (e.g., two people are holding it or someone threw it after the music stopped), play rock paper scissors to make a decision. The last person left in the circle wins. Adult Version: Move the circle out so people are sitting a few feet apart and have to toss the balloon from one person to the next. If it’s a terrible throw to the next person, that person is out. If it’s a good throw but the person drops it, the person who dropped the balloon is out. 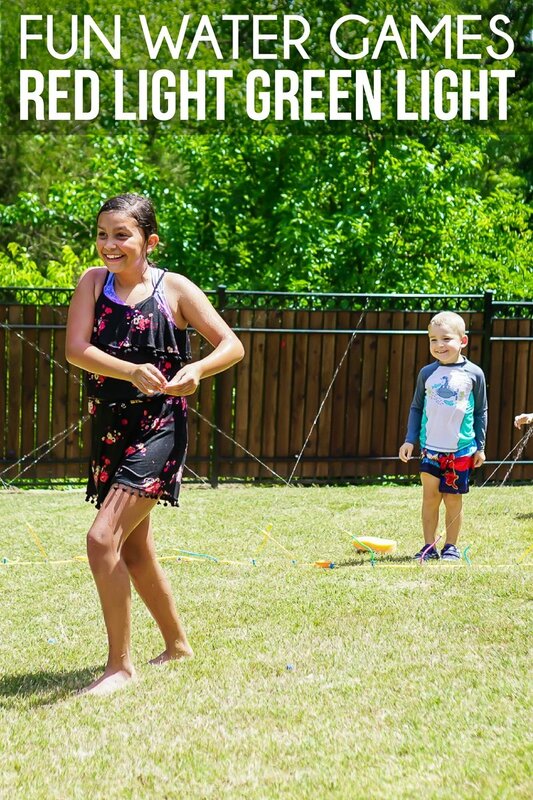 These are variations on some of the best kids games that you play with the sprinkler running! 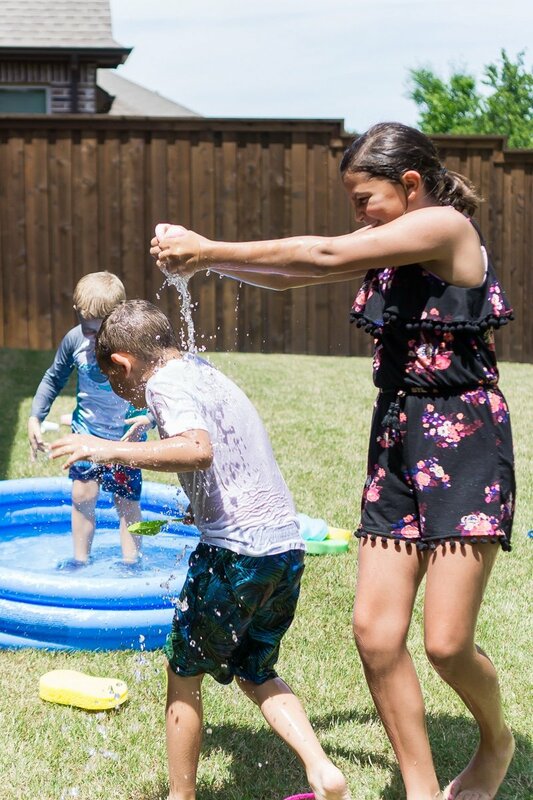 The added element of the sprinkler getting you wet makes these some of the most fun water games we played all day! Play: This is just a typical game of red light green light with a sprinkler added. Have one person stand at the far side of the yard to be the caller and have the rest of the kids line up at the opposite side of the yard. Set up a sprinkler in the middle of the yard and turn it on. 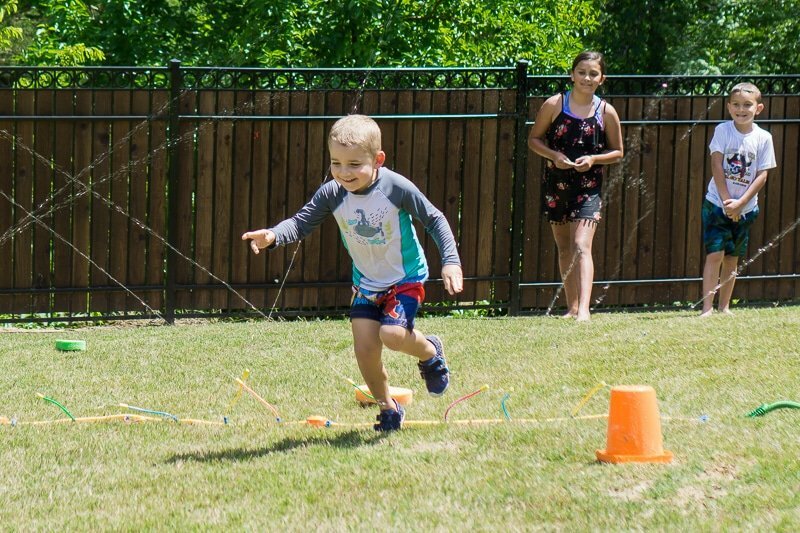 The caller will turn their back to the other kid and say “green light.” When they say green light, the rest of the kids will try to move across the yard to reach the caller. When the caller turns around and says, “red light,” kids have to freeze where they are. If they don’t freeze, they will be sent back to the starting line. Whoever can tag the caller first wins. You can either give out fun prizes or that person becomes the next caller. Having the sprinkler in the middle of the yard adds a fun element because they never know when the caller will turn around, and they might be right next to the sprinkler getting soaked throughout the red light. Play: Just like red light green light above, this is a typical kid’s game just with the added fun of using a sprinkler. Have kids line up on one side of the yard (the minnows) and have one kid (the shark) stand in the middle of the yard. Set up a sprinkler somewhere in the yard that will be the most likely to get people wet. When the shark says to swim across, all of the minnows must run across the yard to the other side before they are tagged by the shark. If they are tagged by the shark, they become a shark and try to tag minnows the next round. The last minnow standing wins and becomes the next shark. Last but not least, some water games and activities that are designed solely for the purpose of getting people wet. These are some of the most fun things to do when you want to beat the heat. You can either do these things by themselves or play some of the games above and end with one of these super soakers! This is just what it sounds like. Get out of the hose, water guns, water balloons, cups, buckets, and anything else that you could use to hold water. Split into two teams and do whatever you can to soak each other. There are no winners – everyone just gets wet! from a nearby home improvement store. Tape it down to the grass on a hill. Get the tarp nice and wet and then put the hose at the top of the slide to keep it wet while the kids are playing. Kids can run and jump onto the tarp to slide down to the bottom of the hill. 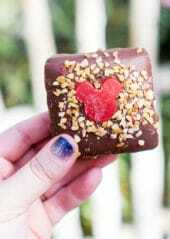 Even better if you add a little dish soap to make it really slippery! Or if you don’t want to get a tarp, use this store-bought Slip N’ Slide instead! Prep: Put a line of cups on a table. Fill about half of the cups full with water and leave the other ones empty. Play: Take turns and have each player one at a time choose a cup without looking (blindfold or cover their eyes). Once they’ve chosen the cup, they have to dump it on their head. If there is water in the cup, they get wet and are out. If there is not water, they continue to the next round. The last dry kid standing wins. 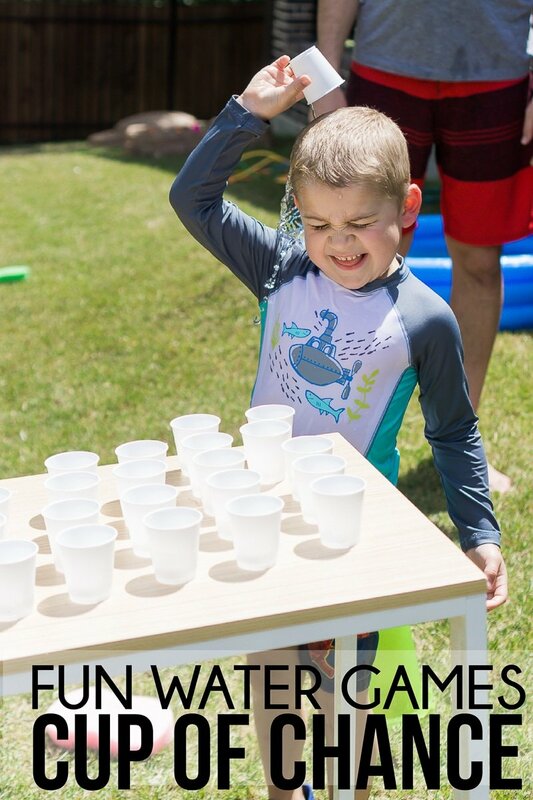 Adult Version: Use larger cups OR have someone else dump the cups on people’s heads so they don’t know what is coming (since you can tell if a cup is empty or full). 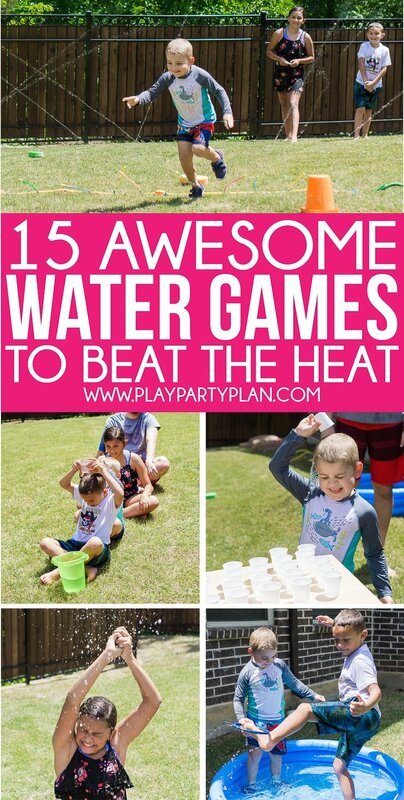 Choose a couple of the games above and have a water Olympics where teams compete in a series of water games. Give the winners medals made with tin foil and poker chips. 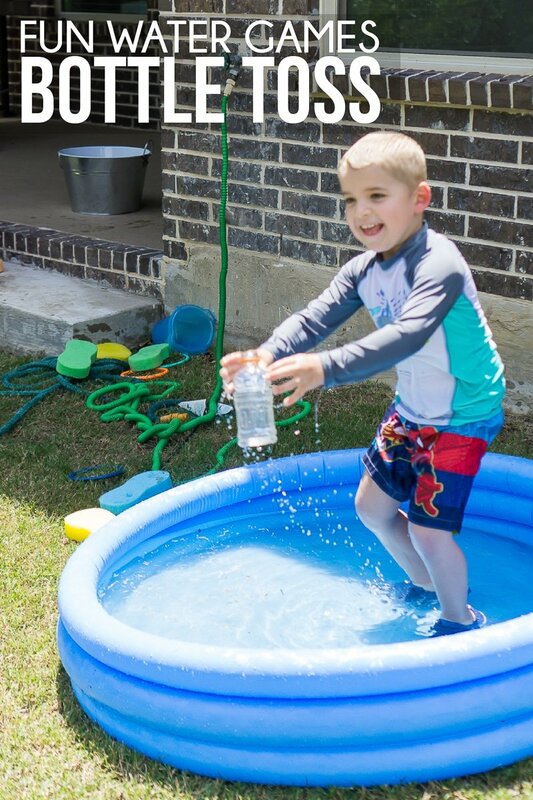 Don’t forget to pin these outdoor water games for later! Thanks for the giveaway! Can’t wait for summer! 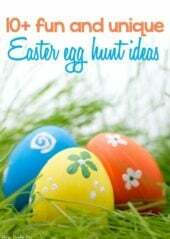 ooh, so many great ideas! We use so many water balloons in Texas, lol! Will use these games for an at-home birthday party for my 7 year old daughter this year. Thanks for the ideas!